Home port: Dartmouth (Great Britain). She was a very successful Twelve, her traditional adversary being Evaine: In 1937 she was first in the season with 13 firsts, 11 seconds and 6 thirda out of 41 starts and again she was first in the 1938 season: out of 48 starts, she had 20 firsts, 15 seconds and 4 thirds; Evaine was again a very close second and Heckstall-Smith claimed that the fight between the two yachts: “… have added to the English yacht racing a new chapter even comparable with those of past history”. In 1939, the presence of the new Twelves: Tomahawk, Ornsay, Jenetta and Vim did not allow Trivia to have similar positive results: out of 32 starts, she had 3 firsts, 9 seconds and 6 thirds. Vernon MacAndrew died in 1940 as a German magnetic mine sank his yacht Campeador converted in a patrol vessel. 1947 – 1948 J. Howden Hume. Home port: Oslo (Norway) and New York, NY (USA). Charles Bay was an American industrialist and US ambassador in Noray. With the new name of Norsaga she entered in several races with positive results particvularly the victory in the three races of the Milkweek 12 Metre Series in the United States. 1957 – 1959 Mrs. Charles Ulrick Bay. At Charles Bay death, his widow Josephine continued in the important business activity of his husband and, by the others, kept also the ownership of Norsaga and she continued to sail her with her guests. 1959 Josephine Bay Paul (Mrs. C. Michael Paul). Lord Craigmyle was the chairman of the Red Duster Syndicate and Norsaga was modified by John Arthur Robb in order to act in 1963 and 1964 as the trial horse for Sovereign and Kurrewa V in the 1964 America’s Cup selections for the challenger. During the 1963 Cowes Week she beat Sovereign in a series of unimpresssive and inconclusive results for the British challenger; in May and June 1964 she entered the trials organised in Britain on nineteen runs between Sovereign, Kurrewa V, Sceptre, Flica II and Norsaga. She was then transported to the U.S.to continue her training to Sovereign with the selection trials organized to appoint the challenger between Sovereign and Kurrewa V. She was then sold in the USA. Home port: Milwaukee, WI (USA). She was first on a fleet of 185 yachts in the 1968 Chicago-Mackinac race still well remembered for formidable weather conditions with heavy seas and 50/60 knot squalls; Phoenix set a record time of 37h 40m over the 333-mile course, the fifth best result in the history of the race; another Twelve, Mitena, was second. Home port: Washington, DC (USA). Home port: Port Washington, NY (USA). During this period, Phoenix sank after an accident. The wreck was brought back to England in the mid Eighties and was kept there, waiting for restoration. She was restored by Giorgetti & Magrini at the Camper & Nicholson yard with a new mast and rigging by Harry Spencer. She entered the Mediterranean program of races for the Twelves. She is considered as an example of restoration which strictly conforms to the original design and construction. Until 2000 her home port was Monaco and she took part in the European Championship for Twelve Metres, obtaining some good results. In particular, she won the Porto Cervo Regatta and the Coupe des Yacht Club de France in 1993, and the Voiles de Saint Tropez in 2000. In August 2001 Trivia participated in the 150-year America’s Cup Jubilee in Cowes. So she was back in the waters of the Solent, where she was originally built and also restored. 36 Twelve Metres from across the world joint for this unique event which brought back an era of truly exceptional yacht racing. Since 2002 Trivia is again sailing in the Baltic sea together with the Nordic fleet of Twelves and has won numerous regattas, including the Robbe & Berking Cup in Flensburg and the Europe Week in Svendborg in 2003. In 2007 Trivia returned to the Mediterranean together with many other 12 Metres to celebrate the 100 year anniversary of the Metre Class with a series of regattas, the Centennial Tour. 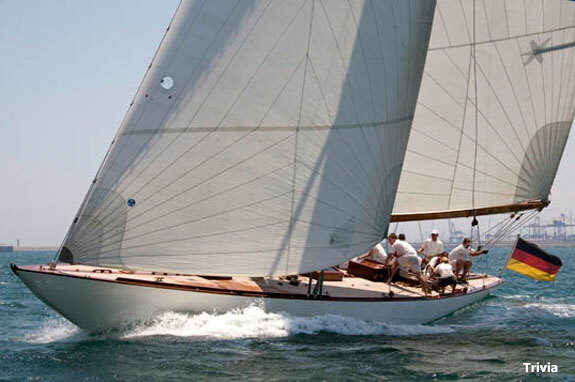 Trivia won 10 of the 18 races in Valencia, Porto Cervo, Cannes and Saint Tropez and finished first overall in the Vintage Division of pre World-War II boats. In 2007 she got a new deck while the interior has been refurbished; also the sail plan has been changed to conform to the 12 Metre Rule. In 2008 she was back in the Baltic Sea for the 12 Metre World Championship in Flensburg where she took an excellent 2nd place behind the Prada team on Nyala and finished first overall in the Baltic 12 Metre Cup. Winner for the Rolex Classic Week 2010 In Kiel (Germany).